In Microsoft Office Project Professional 2003, opening or saving a project plan from Project Server is very sensitive to network bandwidth, latency, and the size of the project plan. Each time a file is opened from or saved to Project Server 2003, the entire project file is downloaded to the client application or saved to Project Server. In Microsoft Office Project Professional 2007, the local project cache feature enables efficient client-server connectivity. Whenever you use Office Project Professional 2007 to open a project from Microsoft Office Project Server 2007, the profile is saved as part of the local project cache. When the project is opened again from the server, the project is opened quickly, because only the changes made to the project (rather than the entire project) are downloaded from the server. Similarly, when you save a project to Office Project Server 2007, the project is first saved to the local cache and control is returned to the user. The local project cache then asynchronously saves the changes (rather than the entire project) to the server. Local project cache settings can be specified in Project Professional 2007. 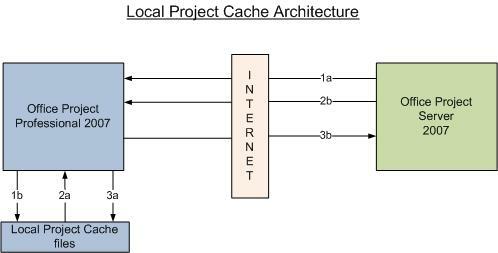 These include the local project cache location and the cache size limit. For more information, see Configure the Local Project Cache settings. The local project cache consists of a set of files that are unique to each project and that are opened and saved under a specific Project Professional user account. The first level of subfolders under the Cache folder is for every Project Server account name that has logged in through Project Professional on the local computer. These are the accounts you set up in Office Project Professional 2007 on the Microsoft Office Project Server Accounts page. You can access this page by clicking the Tools menu and then clicking Enterprise Options. None of these files should be externally modified, moved, copied, or deleted. Tampering with these cache files may result in data loss or undefined behavior in Office Project Professional 2007.